Immunize Your Child Against Attention Deficit Disorder (ADD) By Fred A.Baughman Jr., M.D. What You Should Know About ADD by Fred A. Baughman, M.D. [Media UK, 1997 Tranquillisers--ADD, epilepsy] Elizabeth Wilson finds a group of parents concerned over tranquillisers. Vital Information About Ritalin, Attention Deficit-Hyperactivity Disorder and the Politics Behind the ADHD/Ritalin Movement Summarized from Talking Back to Ritalin by Peter R. Breggin, M.D. Excerpt: "When parents hear me say that attention deficit disorder is a myth, they sometimes become very upset. They think I'm saying that their kids aren't jumpy, distractible, forgetful, impulsive, or disorganized. That's not what I'm saying at all. It's quite obvious to me that our nation's children have probably never been so hyperactive. The question is, what accounts for this? Is it a medical disorder called ADD (or ADHD as it's sometimes called)? I think not. I think instead that what we've learned to call ADD is instead a number of things all jumbled up together under this simplistic label." 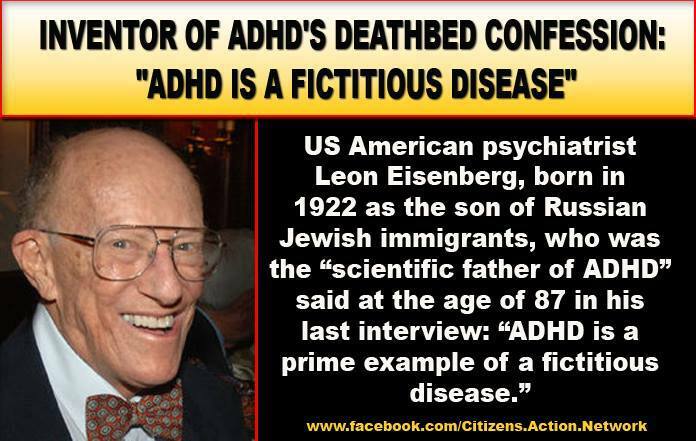 -----Thomas Armstrong, Ph.D.
Excerpt (from page 10): "Confronted with children whom psychologists, psychiatrists and teachers claimed had ADHD, I have not been able to find any abnormalityno disease whatsoever! " Fred A. Baughman, Jr., M.D.